How can I stop my dog doing stuff I don't like? People are often looking for an instant fix to something they don’t like. I’d like a magic wand to wave over life’s problems. Trouble is, people come to me thinking I can wave a magic wand over their dog’s problems and they won’t have to do a thing. You don’t have to be a genius to see that your first step must be - don’t leave him unattended in the garden! You can’t hope to change his behaviour until you’ve changed things enough to prevent him indulging in it. My dog keeps … [insert annoyance here]! If you cannot yet trust your dog in any of these areas, then you shouldn’t give him the freedom to carry on doing what you don't like! Practice makes Perfect - this doesn’t just apply to piano and tennis! Every time your dog indulges in one of these annoying activities he’s getting more fun from it, and getting better at it. It becomes a habit - and we all know how hard habits can be to break. The good news is that good habits are just as hard to break as bad ones. Free online training workshop for you and your dog! If your toddler had a fascination for the oven, you wouldn’t be leaving her unattended in the kitchen. If your 6-year-old is a danger on his bike, you wouldn’t let him out on the road on his own. If your teenager was beginning to mix with the wrong crowd, you wouldn’t be cheerily waving him goodbye of an evening, knowing you’ll be finding him in the police station later that night. So if your dog is doing something you don’t like, the first thing to do is make sure he can’t do it. You can shut the door to the front room when you’re not there (this will prevent chewing the furniture and barking at the window). You keep your dog in the same space (room/garden) as you so he can’t chew shoes, raid bins, dig up the flowerbeds, bark at the moon. And if he runs off on walks - you use a long line so that he can roam but not ramble. Now that isn’t the end of the story. And none of this should be forever. 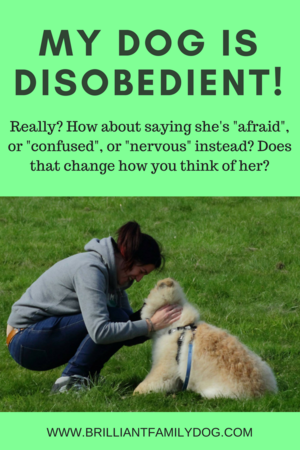 Once you’ve got a measure of control over the situation, and you’ve removed the frustration and the yelling, you can start to re-teach your dog what you’d like him to do. Dogs don’t exist in a vacuum. They can’t NOT do something - they’re doers. So once you’ve eliminated what you don’t like, the way is open to change your dog’s habits to what you do like. So come and join our free 5-day Workshop today! 5 days of free online training, with videos, text, and live broadcasts. You’ll get to meet a host of other lovely dog-owners who are looking to improve the connection between them and their dogs. What you expect is what you get - or, Be careful what you wish for! Really. People say these things. And they become self-fulfilling prophecies. 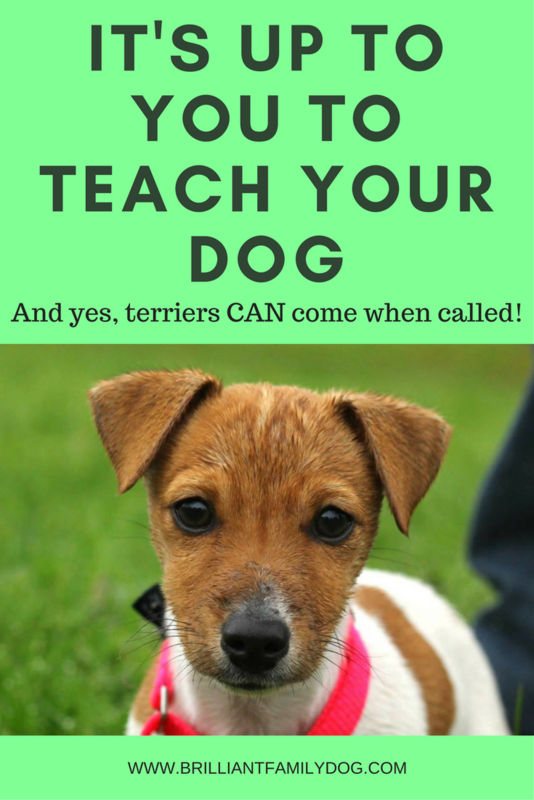 If you truly believe that your terrier will never come when he’s called, then guess what? He never will. If you really think that your spaniel is incapable of focus, then you’ll never put in the work needed to build a team with him. And if you truly think your dog is too stupid to learn anything, you have a cast iron excuse for never bothering to teach him. These are all lazy, get-out, clauses. You got a dog - you thought it would be a good idea - then found that it didn’t come with training and manners installed. You were expected to add these yourself? Oh no! Work required - application, dedication, education, understanding, patience … This all seemed too hard. Much easier to claim that your dog is untrainable and leave it at that. Get your free email course here to learn how to teach your dog kindly and effectively. So her first dog is perfect, and the second is not. (I wonder how much this had to do with the individual attention that No.1 got, while No.2 was tossed into the mix to sink or swim?) Her dog is disobedient, she doesn’t listen, and won’t take no for an answer. This dog needs a program of training which caters to her own individuality, her own quirks and foibles. You cannot blossom when continually compared with someone else - you have to have a pride in your own achievements, done your own way. “My dogs don't understand the meaning of NO either - why? I never say “no” to them. “No” doesn't give them any information about what you'd like them to do - only that you're cross with them. Try focussing only on what you do want, and rewarding that. Totally ignore what you don't want. Give it a week and see where you are! This took her about 10 days to achieve. Sadly I didn’t hear from her again. So I guess Dog no.2 is still being shouted at. There has to be change for change to happen. And the first change is in your mindset! All our dogs are capable of being trained, of learning new things, and of fitting into the household comfortably. Yes, it takes time, and all that dedication and self-education, understanding and patience, mentioned above. But is it worth it? What do you think? But what about my terrier / spaniel / dumb dog? • To see just what terriers are capable of, take a look at Jesse the Jack Russell Terrier. You will be amazed! • Think of what spaniels are bred for - hours and hours of tireless work in the field, focussing on one thing only - finding birds. They are capable of laser focus - if the reward is right you can teach your spaniel to focus on anything you like! • And as for our dumb dog … it’s true that some dogs are not blessed with as many brains as others. Cricket the Whippet will never beat Rollo the Border Collie in an initiative test, though if there is food to be found - she’ll find it! Her phenomenal speed is in her legs, not in the workings of her brain. But she has plenty to offer, and once you’re on her wavelength you can teach her some very un-whippety things to do. Cricket - and Bolt, another whippet I know - have great retrieves. Here’s Cricket showing off her amateur dramatics. You see? Her gift is in making us laugh! 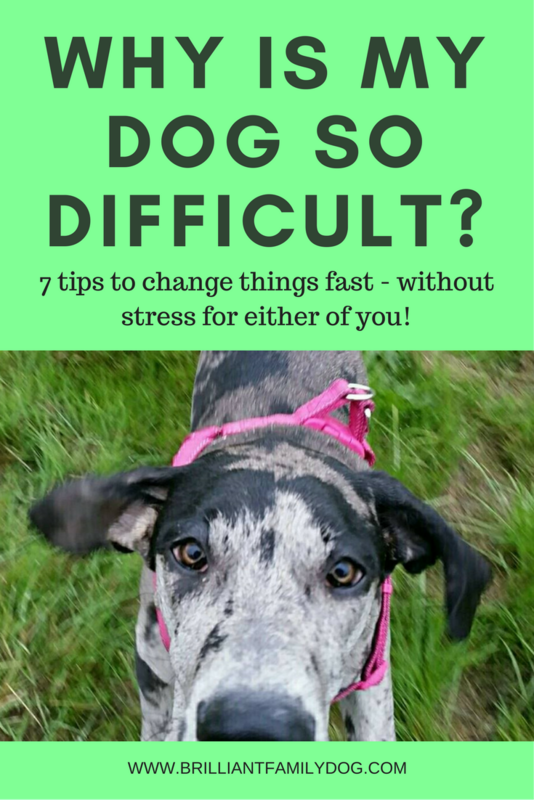 To find your way into the workings of your dog's brain so you can teach her just what you want her to learn, get our free 8-part email course with lots of tips and tricks for getting fast results! Why is my friend's dog so easy when mine is so difficult? 7 tips to make life easier! It’s all a matter of perception. Maybe, for a start, your friend is laid-back and easy-going. While you are wired and anxious by nature. Perhaps your friend is the kind of earth-mother who can cope happily with a household of children and pets with no cares about being houseproud. It could be that this is your first puppy, and your friend is on no.4. Are you comparing apples with oranges? Your friend’s dog could be mature and settled, while yours is still a wild puppy. Or maybe … just maybe … the dogs are different, and yours is more challenging. Is this your first puppy? Many people remark on how easy their second child is compared with their first. The unfortunate first child has to deal with all the expectations, hopes, and fears - not to mention the awkward and novice parenting - and of living up to everything her parent always wanted in a child. Your first pup suffers some of the same unrealistic expectations. Take it easy! The breed or type of your dog will make a big difference too. Especially if you went for a dog that is bred principally for looks and not purpose or temperament. Many of the currently fashionable so-called “designer dogs” would fit into this category. What I mean by that is that if the breeder is selecting for looks, then temperament may not get much of a look-in. This is where the extreme importance of choosing the source of your puppy wisely comes in. You want to know that the parents’ temperaments have been assessed along with their looks. We’ve all met good-looking cads in our life! We don’t need a four-footed version in our home if we can possibly help it. If you have chosen a breed or type of dog that has been bred for hundreds - or thousands - of years to do a certain thing, and do it very well, that behaviour will be inbred in the dog. It will be part of his instinctive drive and no amount of saying NO will change that. So you have to know what you’re up against. If you don’t want a dog with a strong prey-drive, you may want to avoid sighthounds. If you don’t want your dog to herd everyone into a corner, a herding dog may not suit you. And if you don’t appreciate your lap being filled with socks, twigs, and teddy-bears, maybe pass on a retriever. If you just want a quiet life, don’t choose a high-energy dog! Having said that, there is no doubt that ALL dogs are trainable. All dogs will respond to force-free training where they find out for themselves what works - and what doesn’t. But there isn’t any need to make the task harder by starting with more challenging material. You may have chosen to rescue a dog from a shelter - good for you! - but it's not necessarily roses all the way now. All adult dogs have established ideas and things that they do, desirable or undesirable. So there may be a certain amount of un-training to do while you re-train what you want. Keep in mind also that a re-homed dog can easily take a couple of months to settle into his new home and know that it’s for keeps. I get lots of emails from people saying “He was great to begin with then after he’d been here two or three months he suddenly started doing xyz, out of the blue.” What was happening was that the new dog was scared to put a paw out of place when he first came, and chose to keep a low profile. Once comfortable and at home, the dog’s true nature is expressed - along with some things you’re not mad about, like reacting to other dogs or house-visitors, or hogging the bed. But don’t worry! A properly-qualified trainer will have the knowledge and experience to turn this around. Your approach to training - indeed to life - could be very different from your friend’s. It’s a long slow process to teach a child not to put sticky fingers on prized possessions. It can be a long slow process to teach an enthusiastic puppy a new (and foreign) way to greet visitors that doesn’t involve flattening them. So a relaxed approach is far less stressful for everyone involved. Parents make their home as childproof as is convenient so they don’t have to be standing over their child all day, telling her what not to do. Employ the same strategy for your puppy, who comes equipped with splendid teeth and claws for optimal demolition work. 1. Be sure your puppy is in an area where both he and your home are safe, then relax! 2. Young puppies should be in the same room as you at all times - except for the large amount of time they’re asleep, when they can be in their crate. Your dog earns his freedom as he demonstrates that he is reliable in new areas. So he doesn’t get free access to the living room, or the garden, until he has proved that he will not dig, soil, bark, or chew, while you’re not watching. 3. If your dog is an ardent chewer, invest in a doggie playpen and feed his habit with lots of chewable items. If his way of playing with the toys you give him is to rip them to shreds, then that’s his choice. Get cheap toys from the charity shop, or plait ropes out of old jeans, so you’re not invested emotionally in the state of the toy. It’s his toy - allow him to know best how to enjoy it. You can, of course, teach him interactive play with you with his toys, so he finds they’re more fun when you are hanging onto the end of them. 4. Ensure your pup is getting the right amount of rest - this is around 17 hours a day for an adult dog. Yes, 17 hours a day. So, more for a puppy. “He never stops,” is always a red flag to me. I know there will be behavioural issues with a dog who can’t switch off. And people usually find their puppy’s behaviour improves dramatically - especially in relation to biting - once they’re getting enough sleep. And if your puppy is not yet giving you a peaceful night’s sleep, read this one. "I really want to learn how to please you!" 5. Tailor your expectations to your dog, his breed or type, his history, and your experience. We don’t expect our toddler, or our schoolboy, or our lovesick teenager, to behave like responsible adults. We educate, coax, and encourage them to reach this state of virtue - often ignoring the things they do which we don’t want repeated. Remember that “educate” means literally “lead out of”. So we are using our knowledge to lead our hooligan child or puppy out of the darkness of ignorance, and into the civilised world. This takes time! 6. A puppy of around six months old is developmentally somewhere near a child of 9-12. Don’t expect too much too soon! 7. Be careful what you draw attention to! What you focus on is what you get, so be sure you show your dog what you’d like him to do in any situation, rather than nag and complain when he doesn’t know. This article will give you some guidelines. Once you satisfy your new companion’s basic, instinctive, needs - and adopt a realistic view of the training task ahead - you’ll be able to put some boundaries in place so you can all get along in the same household without friction. And start enjoying your dog’s individuality! Hands up who’s never shouted at their dog! I don’t see any hands. 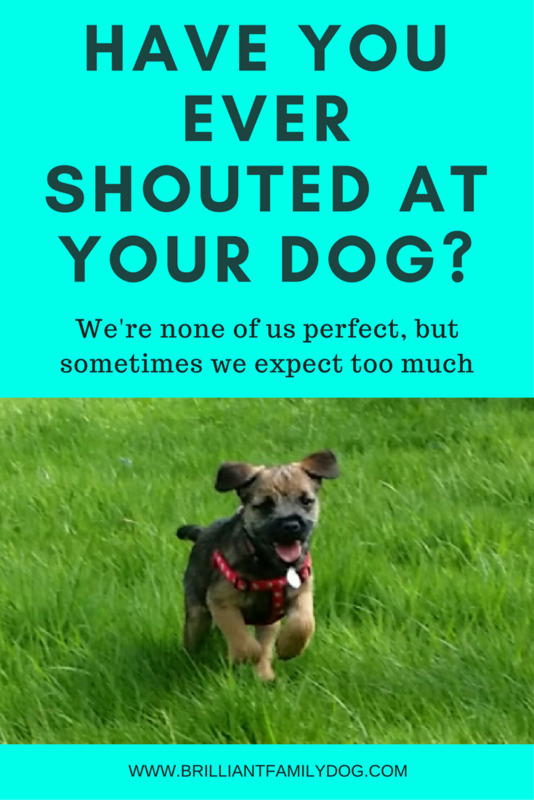 If you have really and truly never shouted at your dog - in frustration or annoyance, then I admire you! You are one in a million. You can go to the top of the class and give out the bones - while I continue with the other 999,999 people. Now I’m not talking about fury or abuse. That would be inexcusable. I’m talking about the daily niggles that cause us to shout at or nag - even those we love most in the world. As soon as we’ve done it we wish we hadn’t. Because, apart from damaging our relationship, it really doesn’t work to get us what we want. It doesn’t work for family members or work colleagues, with our sophisticated human brains, reasoning power, and social skills. So there’s little hope of it working for your dog! They do what works. They aim to please - but it’s often very hard for them to know how to please. We say one thing when we mean another; we call them, ask them to sit, tell them to go away, to lie down, to vanish - what do we want? You have to look at the bigger picture in order to convey clearly what it is you’d like your dog to do. You are clearly responding to his bouncing with excitement, so he bounces some more. Now you’ve taught him to jump all over you. Out of frustration you begin to sound crosser. He’s done a smashing recall and instead of appreciating that and congratulating him for his speed and enthusiasm, you are nagging him now about something he doesn’t understand. He mooches off feeling deflated. What’s going to happen next time you call him? Hmm, not so speedy or enthusiastic, I think. So separate out in your mind what your dog is doing when, so that you can respond to the individual actions rather than the whole thing at once. If you call your dog, you reward him for coming to you. That’s all. Fancy stuff, like sits, can all be added later, when you’ve got the recall down. Allow the little doggy brain to focus on one thing at a time, get it right, and enjoy a reward. If you can pick out the little things your dog does which you like and respond to those, he will do those things again and again - because it works. Yes - dogs can learn to do extraordinarily complex tasks, like opening the washing machine, pulling out the washing and putting it in the laundry basket, for example. But this takes time to teach, and has to be broken down into little stages, each of which is taught separately. When all the parts are mastered, the whole sequence can be put together. On a technical note, this is often taught backwards. The dog first learns to put washing in a basket, then they learn to pull it out of the machine to put it in the basket, and at the end they’re shown how to open the door (stage 3) to get the washing out (stage 2) and put it in the basket (stage 1). So if you want your dog to perform a complex behaviour, like coming when you call and sitting before you, then you must teach the recall on its own, and the sit on its own. Only when they are both 98% reliable do you join them together. If the recall is rocky, then you’ll never get to the sit. And if the sit is wobbly, you’ll only spoil the recall by focussing on the wrong thing. If we can keep our part of the bargain, and ensure that we teach what we want our dog to do, and not expect him to learn it by witchcraft or thought transference, life will become easy and frictionless. Want to be able to train your dog kindly and without frustration? Daily training videos will get you there! Why did you shout at me? Now recollect the last time you shouted at your dog. You can put up your hand now - no-one’s looking. No, my dogs aren’t perfect either. But I know that whenever I catch myself losing patience with my dog it’s my problem, not his. Maybe it’s because I’m tired and rushed - that means it’s the perfect time to have a game in the garden with the dogs. That’ll relax me, please them, and get things back in proportion. “There are no pockets in shrouds,” my grandmother would recite serenely, as she nodded slowly and sucked her teeth. And there are no prizes in heaven (where all our dogs are waiting for us) for having a beautifully clean house and a snapped-at pooch; or a flourishing business and a dejected dog. Shouting at a dog is not only unfair, it damages the trust your dog has in you. You have suddenly become unreliable. Dogs (and children!) need to know that you have feelings too and they can only push you so far. But shifting the blame onto them is never the answer. 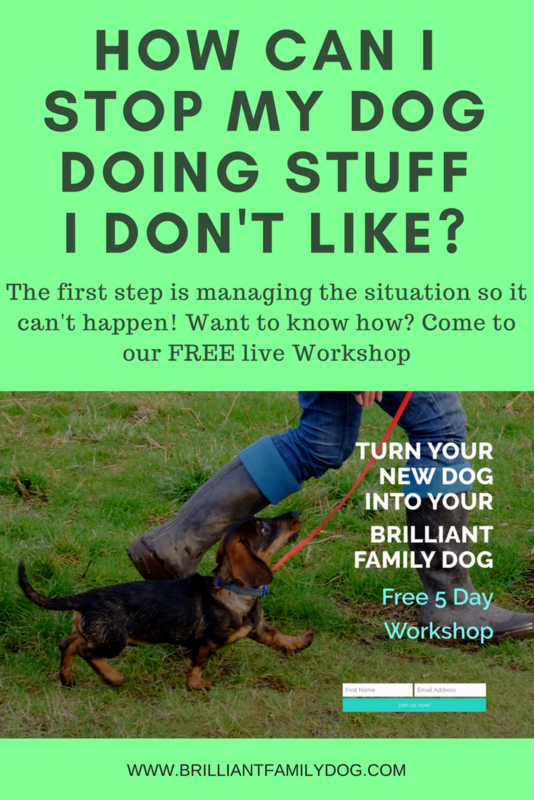 And for all those things which your dog does which frustrate you beyond measure, have a look at the many “recipes” for changing them to things that you’d like him to do, with our free 8-part email course - all force-free, of course. Jumping up, Barking, Digging, Chewing, Nipping - they’re all there!